Ferrari's unveiling of the 365 GTB/4 Berlinetta at the 1968 Paris Salon ushered in a new era of design and cutting-edge performance for the marque, as well as the automotive industry itself. 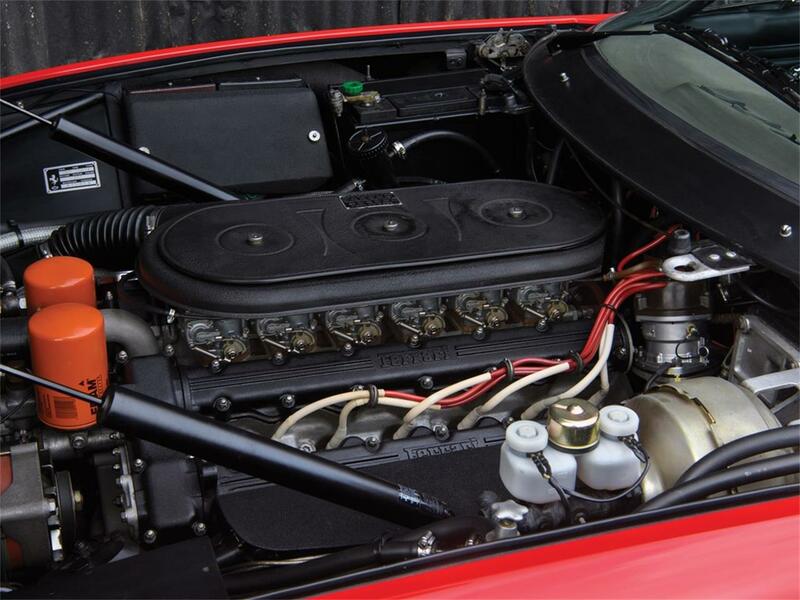 Rather than opt for a mid-engined car like the Lamborghini Miura P400, Ferrari proclaimed that its tried-and-true, front-engined V-12 platform could easily compete and outpace the Miura. 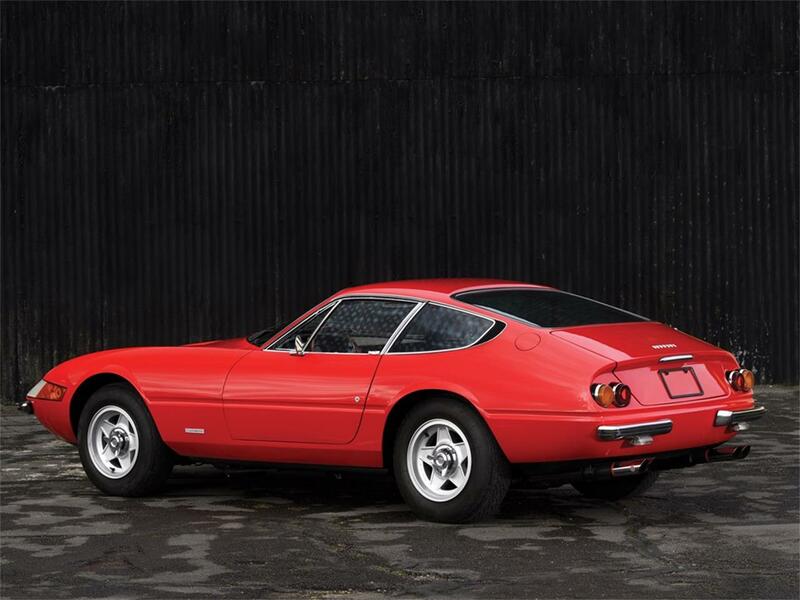 Quickly nicknamed 'Daytona' by the press and other automotive enthusiasts in celebration of Ferrari's incredible 1-2-3 finish at the 1967 24 Hours of Daytona, the road-going 365 GTB/4 could easily live up to its name. 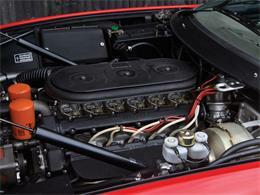 With 352 bhp on tap, it could sprint to 100 km/h in 5.5 seconds, leading towards a top speed of 280 km/h. 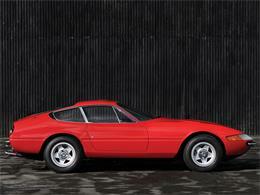 This achievement crowned the Daytona as the world's fastest production car, beating the Miura P400 by roughly 5 km/h. Chassis no. 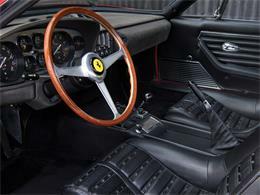 13183 was originally completed at Ferrari's facilities in Maranello in February of 1970. It emerged from the factory finished in Rosso Chiaro (20-R-190) paintwork over a Nero (VM 8500) leather interior, built to left-hand-drive European specifications, equipped with the early Plexiglass nose, as well as power windows, a radio, knock-off Cromodora alloy wheels and the desirable factory air-conditioning. 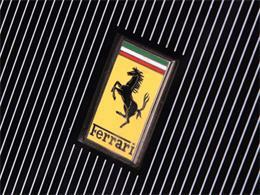 It would remain in its native Italy and was delivered to Romeo Pedini, Ferrari's dealer in Perugia, Italy. 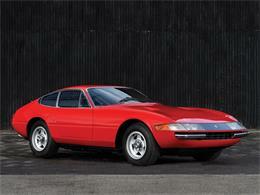 Its first owner would be a Mr. Rossi, who purchased the car that same month. Registered under registration no. 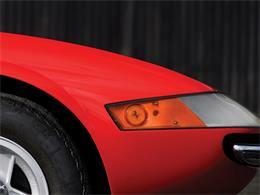 PG 157308, the car remained in Italy until at least 1973 prior to moving to Milan. At some point thereafter, it was exported to the U.S. and noted as being in the ownership of Avi R. Brand of Woodbury, New York, a small town north of New York City by 1979. In 1982 it was sold to an undisclosed owner who offered the car for sale with Graham Cox, Hallandale, Florida, and Motorcars International of Springfield, Missouri, in 1994. 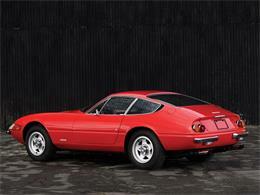 Ferrari Market Letter ads described it as '365 GTB/4, S/N 13183 (1970 Euro prod.). Red with tan interior. 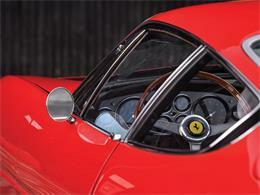 Plexiglass nose, Borrani wire wheels, factory a/c. Same owner since 1982. 38,409 miles. Extremely nice and original. Don't miss this one.' Another Ferrari Market Letter ad shows the car offered in California in April/May 1995; it was then sold to a collector in Japan later that year. 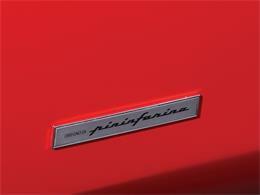 Boasting an older restoration, the car received a recent cosmetic freshening and is presented today in its as-delivered colour combination. In December 2018, the Daytona was shipped to Joe Macari's workshops in London, an authorized Ferrari aftersales service centre. 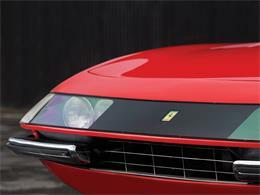 There, the car received some service work, with the intention of bringing it in line for Ferrari Classiche certification. 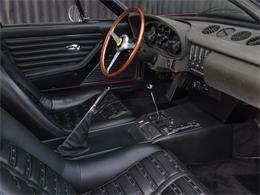 It was fitted with a correct type brake fluid reservoir and wood-rimmed steering wheel, amongst other minor items. Now granted Ferrari Classiche certification, the accompanying 'red book' states that it retains its original engine but is fitted with a replacement gearbox of the correct type. 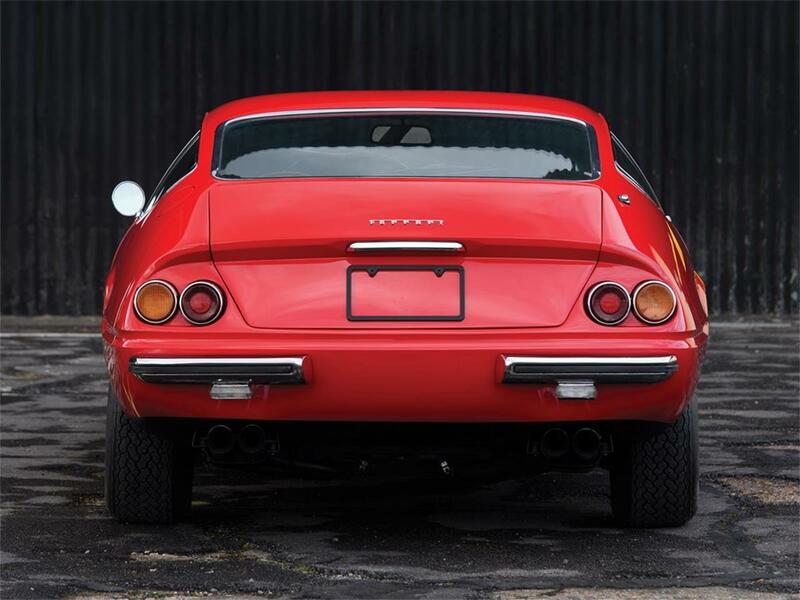 An icon of performance and engineering, the Daytona is a staple of any world-class Ferrari collection for its stunning good looks, impressive performance and grand touring capabilities. An early example now boasting Ferrari Classiche certification, this example would be a thrilling addition to any collection. Die Vorstellung des 365 GTB/4 Berlinetta 1968 auf dem Automobilsalon in Paris l�utete eine neue �ra des Designs und modernster Technik bei Ferrari ein - und nicht nur dort, sondern in der gesamten Automobilindustrie. Statt sich wie Lamborghini beim Miura P400 f�r ein Mittelmotorkonzept zu entscheiden, war Ferrari sicher, dass die bew�hrte V12-Frontmotorplattform es locker mit dem Miura w�rde aufnehmen k�nnen. Schnell gab die Presse dem Wagen seinen Spitznamen: Daytona - in Anlehnung an Ferraris unglaublichen 1-2-3 Sieg bei den 24 Stunden von Daytona 1967. Das 357 PS starke Coup� ben�tigte nur 5,5 Sekunden f�r den Sprint auf 100 km/h und erreichte eine Spitze von 280 km/h. Das machte den Daytona zum schnellsten Serienfahrzeug seiner Zeit, schlug er doch sogar den Miura um rund 5 km/h. Chassis 13183 wurde im Februar 1970 im Ferrari Werk in Maranello in der Originalfarbkombination von Rosso Chiaro (20-R-190) mit Leder Nero (VM 8500) hergestellt. Der Linkslenker in Europa-Ausf�hrung mit der fr�hen Plexiglasfront verf�gte �ber elektrische Fensterheber, ein Radio, Alur�der mit Zentralverschluss von Cromodora und die so gesuchte Klimaanlage. 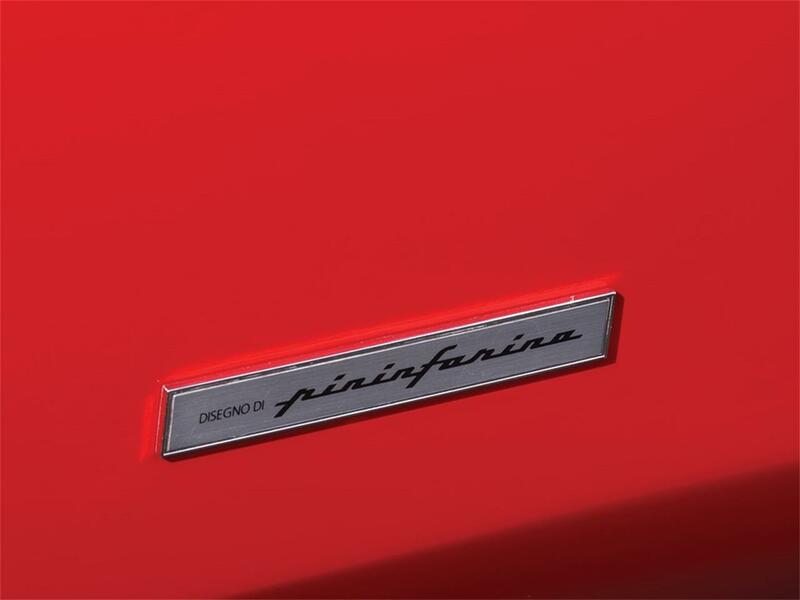 Er blieb in Italien und ging an den Ferrari H�ndler Romeo Pedini in Perugia. Als erster Besitzer ist ein Hr. Rossi verzeichnet, der den Wagen im gleichen Monat erwarb. Zugelassen mit der Nummer PG 157308, blieb dieser Daytona in Italien bis mindestens 1973. Irgendwann danach ging er von Mailand in die USA, wo 1979 ein Avi R. Brand aus Woodbury, einem kleinen Ort im US-Bundesstaat New York, als Besitzer verzeichnet ist. 1982 wurde er an einen unbekannten neuen Besitzer verkauft, der ihn bei Graham Cox aus Hallandale in Florida und bei Motorcars International in Springfield, Missouri, zum Kauf anbieten lie�. 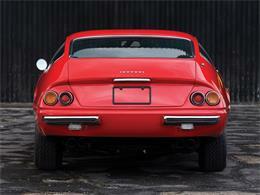 Anzeigen im damaligen Ferrari Market Letter beschrieben ihn so �365 GTB/4, S/N 13183 (1970 Euro Prod.). Rot mit beigem Innenraum. Plexiglasfront, Borrani Speichenfelgen, Klimaanlage ab Werk. Ein Besitzer seit 1982. 38.409 Meilen. Ausgesprochen sch�n und original. Lassen Sie sich den nicht entgehen". Im Dezember 2018 wurde der Daytona zur Werkstatt von Joe Macari in London geschickt, einem autorisierten Ferrari-Servicecenter. Hier wurden einige Arbeiten durchgef�hrt in Vorbereitung einer Zertifizierung durch Ferrari Classiche. Zu den kleineren Anpassungen geh�rten der Einbau des korrekten Bremsfl�ssigkeitsbeh�lters und eines Holzlenkrads. Die Zertifizierung von Ferrari Classiche verzeichnet im begleitenden �roten Buch", dass dieser Wagen noch �ber seinen Originalmotor verf�gt, jedoch irgendwann ein Ersatzgetriebe des korrekten Typs bekommen hat. Mit legend�ren Fahrleistungen und bahnbrechender Technik ist ein Daytona ein hervorragender Grundstock jeder Ferrari Sammlung. 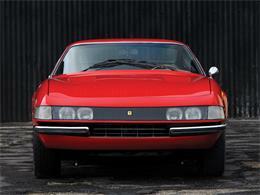 Dieses fr�he Exemplar mit Ferrari Classiche Zertifizierung w�re eine aufregende Erg�nzung jeder Sammlung. To view this car and others currently consigned to this auction, please visit the RM website at rmsothebys.com/en/auctions/es19.